Every good defense needs a Torbjörn. People panic in Overwatch when they're getting shot at and Torbjörn's turrets are very good at shooting at people. But for the most part, the tiny Santa Claus has not changed much since the game release. Now, according to Jeff Kaplan, we're going to start seeing more changes for the gruff old mechanic. It's not a drastic change, Kaplan warns, but completely eliminating armor and scraps seems pretty drastic to me. Torbjörn replaces those abilities with Overload, which is a less intense version of his previous Ult. He moves faster, takes more hits, and shoots at a higher rate of speed. This also means turret upgrading is completely gone, as well. 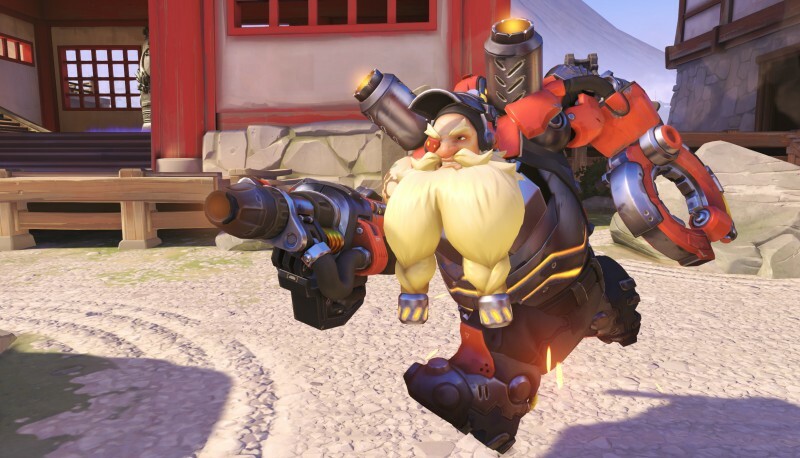 Torbjörn can toss out a turret, which will build itself over three seconds, up to the equivalent damage of a level 2 turret. It can't be upgraded past that, but hitting it with the hammer still repairs it. Since his old Ultimate is now his secondary ability, Torbjörn's new one is simply called "Molten Core," which allows him to spit out pools of lava on the floor. This lets players zone out approaching enemies and keep them at bay or drive them to certain spots for traps and ambushes. Blizzard goes into exact detail, including changes to the rivet gun, in their blog post here.